Millennials are now every brand’s most important customers and every firm’s most relied-upon workers. They control over $600 billion in annual spending, and their changing tastes can make or break your company. 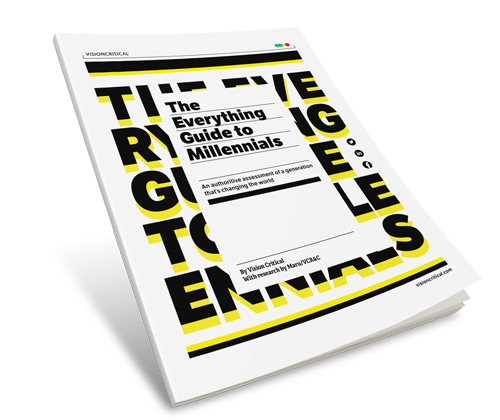 The Everything Guide to Millennials is your crash course. Don’t miss out on the $600-billion Millennial opportunity. What Millennials think of finance, technology, media, entertainment, retail, health care, tourism and travel. Their opinions about the workplace, social causes and politics. Millennials are a remarkably optimistic generation whose impact has already been deeply felt in politics, society and the economy. They’re eager adopters of new technology, especially when it gives them more control over their time and their lives. They dislike traditional advertising—to the point of actively avoiding it. They prefer to research products and services on their own time, through their own pathways, to draw their own conclusions. They rely strongly upon social networks for referrals on the best products, services, travel destinations and food experiences. They’re an active generation that believes good health is both a personal and social responsibility. They’re big spenders who will pay a premium for a better, more socially responsible product—but they most want goods that are high quality, affordable and ethical all at once. They seek employment in workplaces that give them opportunities to make their mark, demonstrate leadership and give back to society.